KUALA LUMPUR (Apr 27): DiGi.Com Bhd posted a 1% decrease in first quarter net profit to RM479.22 million from a year earlier on foreign exchange losses besides higher depreciation and amortisation. Mobile telecommunication network operator DiGi (fundamental: 1.55; valuation: 2.1) said in a statement to the bourse today higher business expenses and finance cost had also curbed profit. DiGi's RM479.22 million net profit in the first quarter ended March 31, 2015 (1QFY15) compared with RM485.16 million previously. Revenue, however, increased to RM1.79 billion from RM1.72 billion, contributed by stronger take-up of internet packages as the number of subscribers grew. For 1QY15, DiGi plans to pay a tax-free dividend of 6.1 sen a share. "We have made strong inroads in bringing quality internet services to more Malaysians nationwide, fueled by significant improvements in our network performance and coverage, the proliferation of a wider range of affordable smartphones bundles including choices under RM200, and innovative digital service offerings. "These efforts have helped drive continuous growth in internet adoption, and encouraged ownership of more than one device which is connected to the internet," said DiGi group chief executive officer Albern Murty. According to DiGi, data revenue rose 17.7% while internet revenue increased 35%. DiGi recorded 270,000 additional subscribers to 11.7 million. Looking ahead, the company said it would capitalise on higher mobile internet adoption to grow revenue. The group also hopes to improve operational efficiency to support profit growth. "DiGi believes that there are good growth opportunities for the mobile industry fueled by strong demand on internet. Therefore, DiGi will continue to drive growth opportunities with strong focus on Internet For All offerings and monetise on data usage. 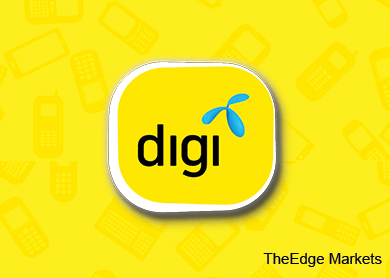 "In addition, DiGi will leverage on operational efficiency and strengthen its organisational capabilities towards becoming the best mobile internet provider for the mass market," DiGi said. At 12.30pm market break, DiGi shares fell one sen or 0.2% to RM6.24 for a market capitalisation of RM48.52 billion. Some 1.6 million shares changed hands.